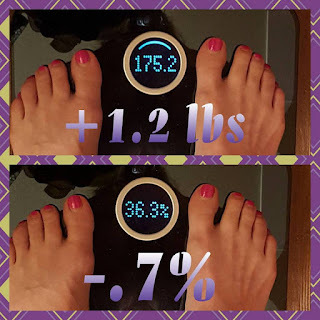 I was pleasantly surprised with last week’s 2.4 pound loss. I didn’t know what to expect, but I know I didn’t expect 2.4 pounds! I think I was expecting like a half or just one pound. Which I would have been completely okay with, just so’s you know. Honestly, I can’t believe that I’m this close to my goal weight and still pulling big numbers on the scale most weigh ins. It partially makes me wonder if 170 should be my goal weight. Maybe I should change to 165? I’ll decide when I get to 170, though. I don’t want to bite off more than I can chew by changing my goal weight prematurely. You know? Anyway, as my goal weight looms on the horizon, pretty much within my reach…if I stand on my tippy toes, that is…I can’t let myself slack off. Not even a little. Now is the time to really buckle down and push myself. I really wanted to make sure my workouts really counted this week. • Saturday: met my friends Neetu and Amanda at the Indian buffet for lunch and ate my entire daily calorie allowance while we were there. I don’t regret it. I pretty much don’t eat out anymore and when I do, I still try to follow the guidelines I’ve set up for myself with calorie amounts, quality proteins, fresh and unprocessed foods, low carb, etc. Splurges just aren’t much a part of my eating routine anymore. And I don’t mind whatsoever. So, since I ate my entire calorie allowance for lunch and it was 2pm when we got done at the restaurant, I wanted to make sure that if I ate again later in the day that I would more than have the exercise calories to cover what I’d eaten and still have a deficit for the day. 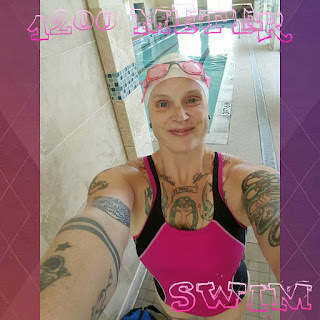 I went to the gym and I did my machines workout (pretty much all the upper body machines, the 3-way ab machine, and I added the abductor and adductor machines too) followed by a 1200 meter swim in 31 minutes. That’s ¾ of a mile, yo! • Sunday: walked my 2nd 5K this day. 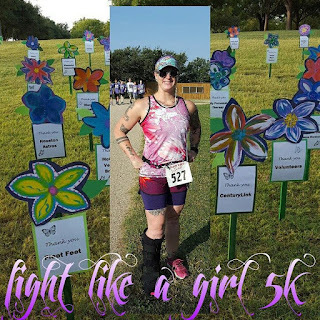 Fight Like A Girl 5K benefiting melanoma cancer survivors and research. Since I registered for this pre-injury and knew it was going to be a super small local race, I paid the extra $10 for a timing chip with visions of age group placement floating around my mind. So, obviously, those visions had to get thrown straight out of the window. My new goal was to beat my Run With The Heroes 5K time of 52:57. I power walked the FLAG course (which was over half cross country style!) and finished in 43:34! BOOM! There were 35 timed participants and I was, of course, dead last. There were 5 ladies in my age group. 3rd place finished in 32:00 minutes. Dude, I could have smoked her had I been able to run! Even untrained, I can run a 5K faster than 32:00!!! Next year! This is Sunday and just a 5K powerwalk wasn’t going to cut it! IT’S SUNDAY FUNDAY Y’ALL!!! I found a few more exercises to add to my repertoire of exercises! YAY! I really enjoy my Sunday funday workouts. I honestly think they’re my favorite workouts. It took me 51 minutes to complete this installation of my Sunday funday workout. I’d really like it to be at least 60 minutes. So, I would like to find 3 more exercises to add to the mix. I have one already that would go with one round, so I just need 3 more exercises to go with the other 3 rounds. 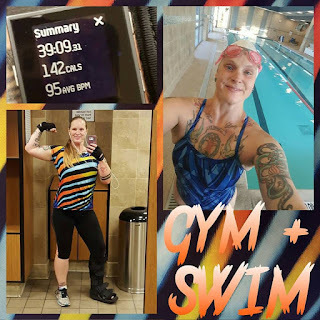 • Monday: so, I decided to call it the “freestyle” workout…at least until something better comes to mind. I’ve been wanting to add the exercise where you hold a slam ball out in front of you while doing a wide-legged squat and when you stand up you toss the slam ball above you against the wall and then catch it and repeat. The last couple times I intended to add this, other people were using all the slam balls, so I wasn’t able to do it. But today I was able to do them! I also changed up my TRX exercises a little by combining them into one move. So much more difficult, so of course I like it way better! I decided on my way from physical therapy to the gym that I was going to wait until Tuesday to swim. • Tuesday: [mental] therapy day! I think I cut it too close with parking at Whole Foods last week…mainly because when I returned to get my car, I discovered that there was now a security guard in the parking area. Good thing he hadn’t been there when I parked! So, I decided to go to a park down the road from my therapist’s office. I walked over 4.5 miles between my pre- and post-appointment walking. By this time, it was almost 1:30pm and time to break my fast, so I went home and had my eggs and waited a little bit before heading to the gym for my swim. 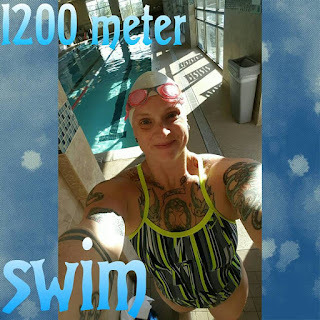 I got 1200 meters done in 30 minutes…a minute faster than Saturday. 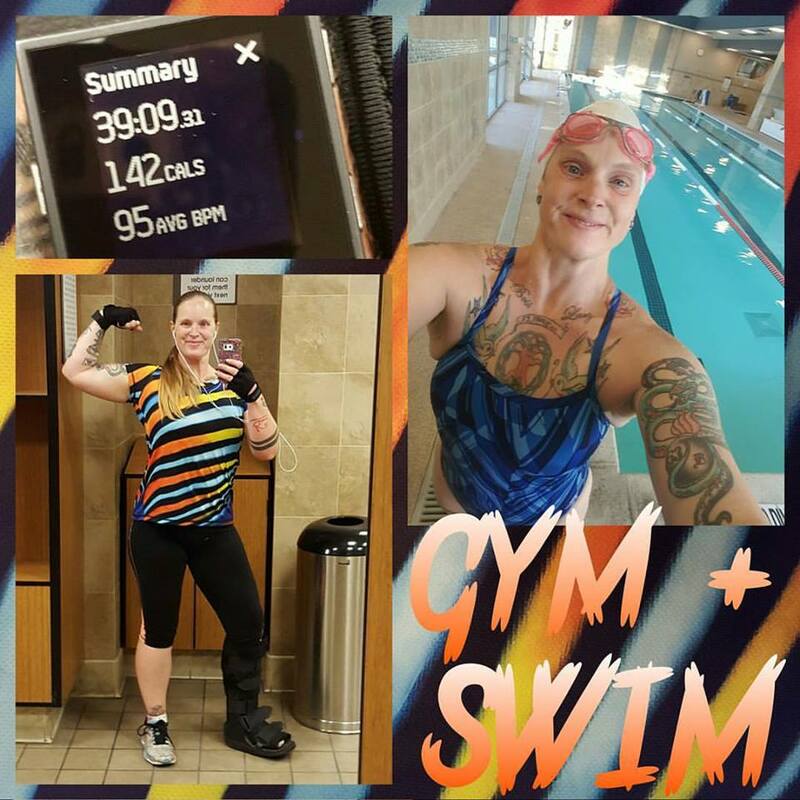 When I got to the gym and got changed into my suit and then out to the pool, I discovered that there was already 3 people in the pool (there are 3 lanes in the pool at my gym). I sat on the bench to patiently wait for one of them to get done so I could get in. The guy in one of the outside lanes noticed me sitting there waiting and said we could share his lane. YAY! 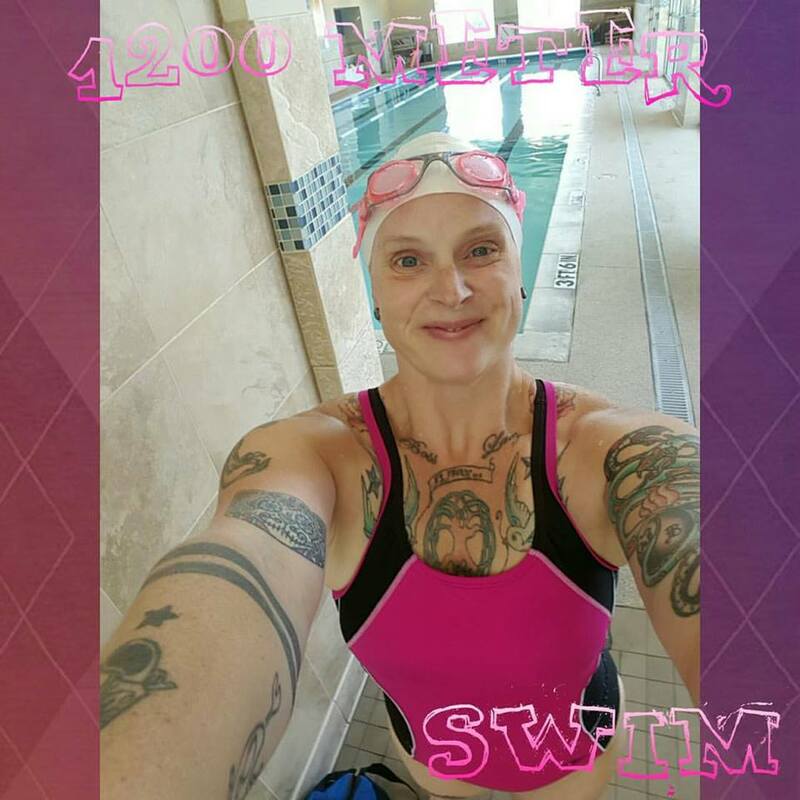 So, for the first 400 meters, I swam in his lane until the guy in the next lane over finished and got out of the pool, so I switched over to that lane to finish out my remaining 800 meters. 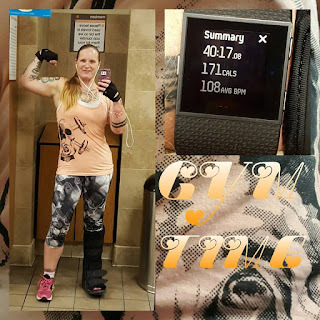 • Wednesday: I went to the gym and I did my machines workout. I’m really trying to push myself with the weights I’m lifting. What my doctor said, even if he was just joking (which I’m not 100% sure he was), it’s still unsettling to think that some of my weight loss IS muscle loss. So, I did my best to make sure that the last 1-2 reps of each set were difficult, but totally doable, for me. • Thursday: went to the gym and got my 1200 meters swam in 31 minutes. 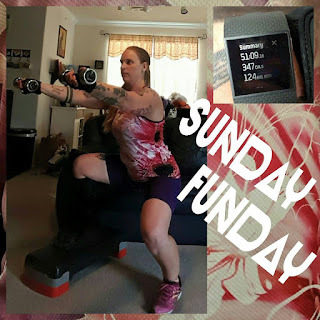 My shoulders and my biceps were both sore and tired from Wednesday’s workout since I added more weight than I’ve been using. 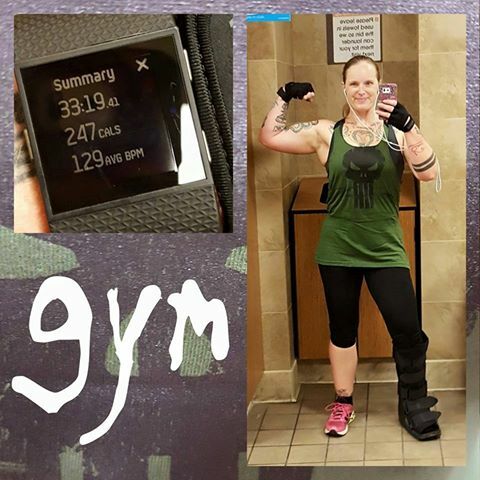 I was originally thinking I might preview a workout DVD or 2 and see if I could do it in my boot, but ultimately decided against it. Went for a 4.25 mile walk to drop off a package to my mom at the post office. Attempted to snoop on the construction site in the lot next to my apartments while on this walk, but the sign I thought might say what kind of construction is happening just had their permits for the sewage and waste water. Bah! • Friday: went to the Texas State Fair with my friend Sam. So, no workout, but LOTS of walking! 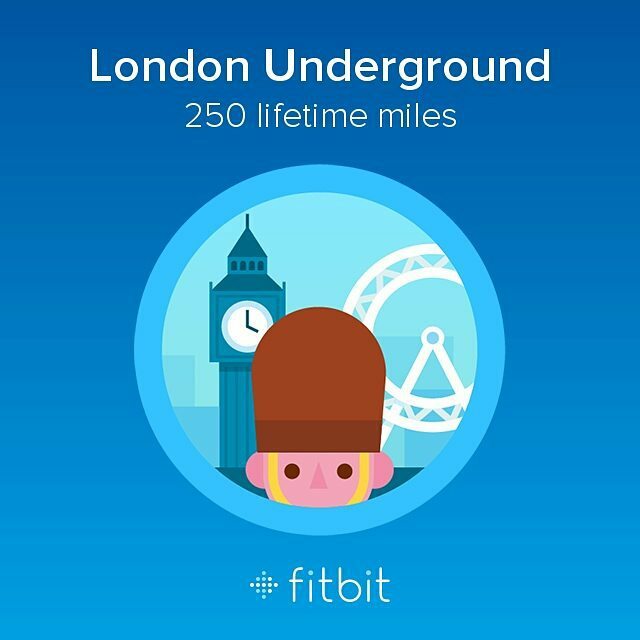 FitBit surprised me with a new badge this week! 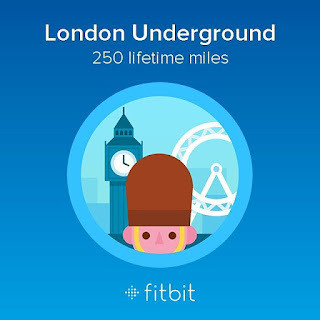 The London Underground for passing the 250 “lifetime” miles mark. I say “lifetime” because it really only applies to the time I’ve had my FitBit account. It’s still really cool to earn new badges! I think I did a really good job again this week. This week, since I went to the State Fair on Friday and there was a very high chance of eating foods that aren’t exactly “on plan.” So, I opted to do this week’s weigh in plus, since it’s the beginning of a new month, my new measurements and progress photos, yesterday instead of today. (back to Saturday next week for my weigh ins) Something that has me a bit unnerved with this time losing weight is that, in the past, I’ve always been able to tell based on how my body feels to me (not by running my hands up and down my skin, just how it feels to be in my body…if that makes any sense at all) whether or not I had lost weight or even gained weight. However, THIS time, I am not having those feelings. It’s so frustrating because weigh in mornings are now a total and complete surprise to me and I have no clue as to how I might fare on the scale. So, I get very nervous the night before my weigh ins now. 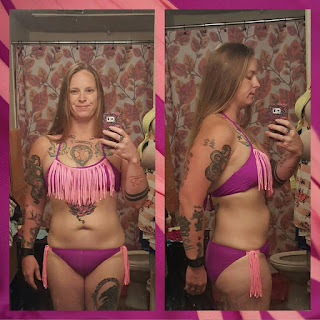 That said, let’s look at my new progress photos first! I have to say…I am super happy with how my body looks. Seriously. I’m not sucking in even one little tiny bit in these pics. They are at natural rest. My stomach looks fantastic!!! Next, let’s move on to my current measurements and compare them to my previous measurements. 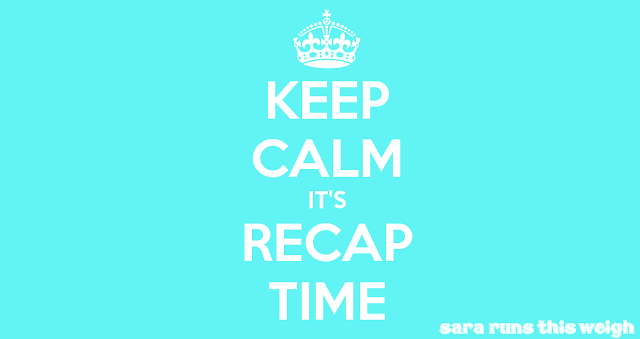 The total lost since the first Saturday of September is 3.45 inches! This is fantastic! If I can lose another inch to inch and a half off each my hips and my waist, I think all will be right in the world for me. I think that will take care of the last little bits of lumps that I find hard to look at on myself in that area of my body. Last, but most definitely NOT least, what does the scale say about me this week? I’m UP 1.2 pounds. But, you know what? I’m okay with it. Why? Because, 1) I’m down 3.45 inches in the last 4 weeks and 2) my body fat % went down this week by .7%. What exactly does that mean? Let me break it down for ya. We’ll start with last week. I weighed in at 174 with 37% body fat. That equals 64.4 lbs of fat and 109.6 lbs of muscle, organs and bones. This week, I weighed in at 175.2 with 36.3% body fat. That equals 63.6 lbs of fat and 111.6 lbs of muscle, organs and bones. 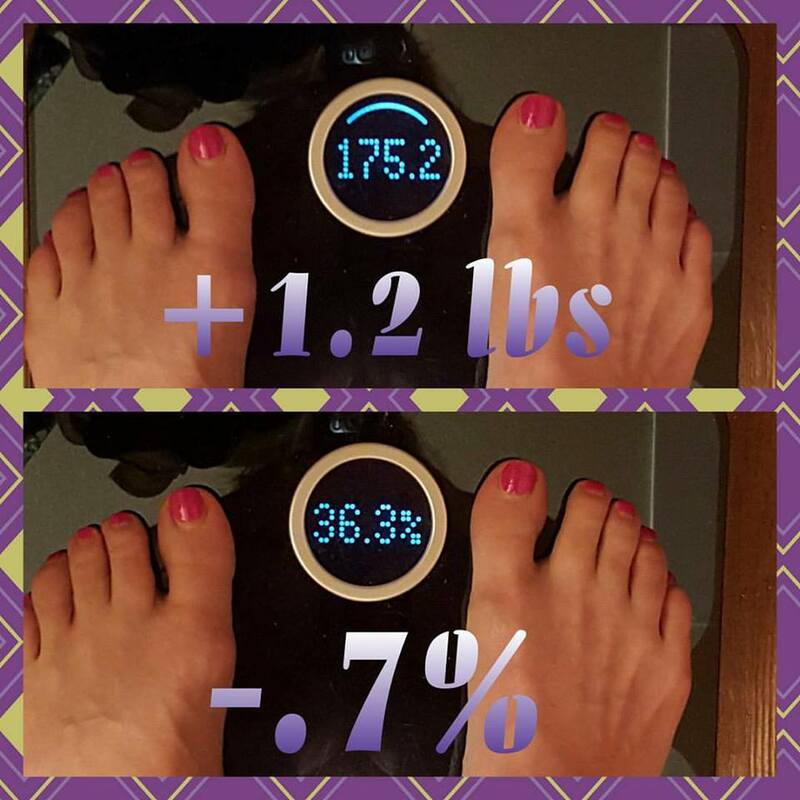 To break it down even a little more, that means I LOST .8 lb of fat and GAINED 2 lbs of muscle!!! WOOHOO! That’s a victory if I ever saw one. I GAINED 2 LBS OF MUSCLE IN 1 WEEK!!!!! That’s got me so excited! 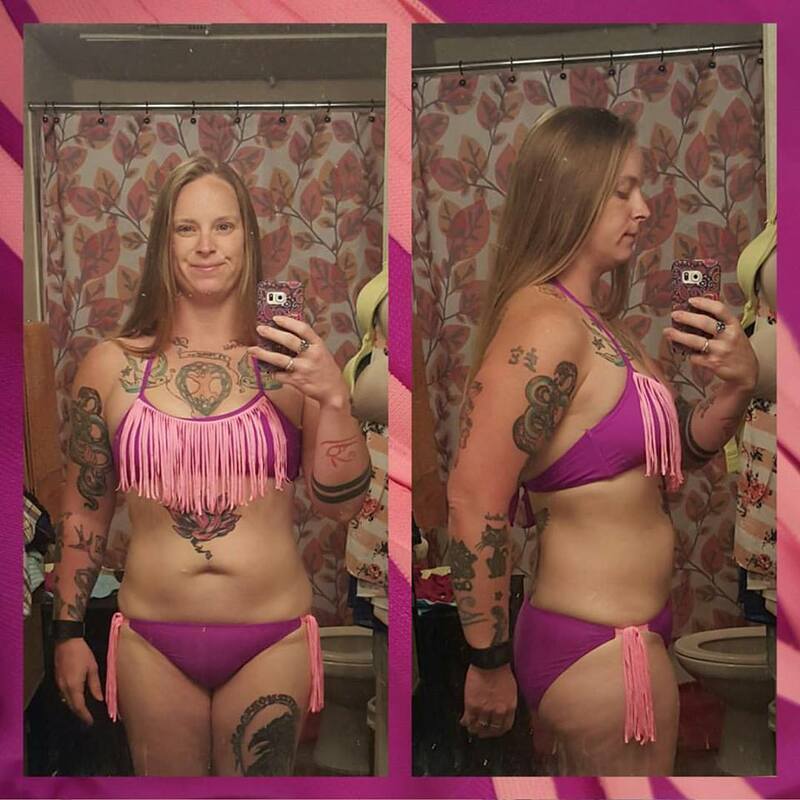 This just goes to show that before you go getting upset that you’re up a little bit on the scale doesn’t mean it’s necessarily a BAD gain. It could be a good gain. I’ve been making a real effort with my strength training lately and it’s starting to show and that makes me H-A-P-P-Y. So, I’m going to do my best to knock my workouts out of the park again this next week and see if I can get that body fat % to go down a little bit more. I’m really liking how my biceps are looking and I’d like to get them to a more defined look. I’d like to get a very small amount of definition in my ab area. No, I’m not going for a 6 pack…heck no. Do you have any idea how much work that is? For starters, I’d have to get down to the low 20’s for body fat %...yea…no…and then I’d have to MAINTAIN that. No thank you. I’m okay with a slightly “soft” appearance. I just want people to look at me and say, “yea, I can tell she lifts, brah.” Hahaha!